WHAT MAKES A GREAT GIF? After a jam-packed Autumn we’re stopping for a moment to take a look back at some of our favourite GIFs from the past few months. Choosing a favourite GIF was like being asked to pick a favourite child, so we have narrowed it down to our top five, which helped soothe the dilemmas and lessen the impassioned arguments going on in the office! There’s many factors that come into play when creating a great GIF – the lighting, the set, the actions, the product relevance – all play their own part, here is a few of our faves…. Warner Brothers wanted guests to get a taste of their Harry Potter studio tour at their SquareMeal event, so our open photo booth was the perfect fit for their Harry Potter set complete with props, set and character from the film as well as some excellent wizard impressions. We are totally under the spell of this GIF. Expelliarmus! 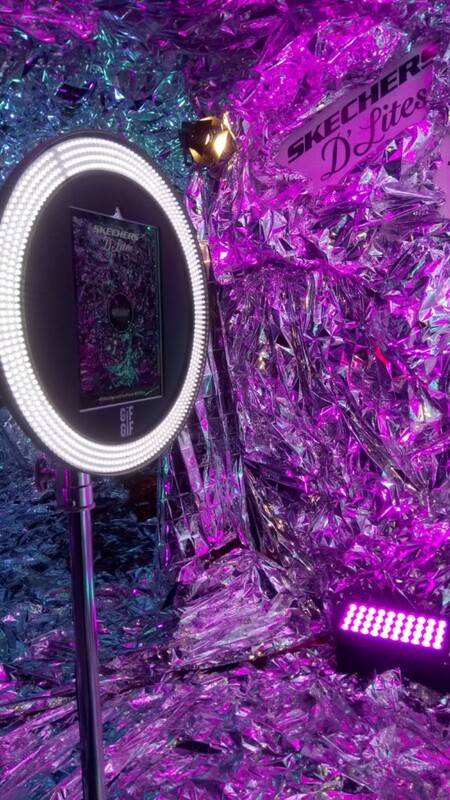 Our ring light gif booth was the perfect choice for the reflective wonderland at the launch party for Skechers D’lites. There’s something about the impact of the beauty ring and the light bouncing off the reflective surfaces that creates a super insta-friendly image. There’s nothing we love more than to amplify your event through creating amazing content that people LOVE to share: Skechers GIF booth users could share their unique social media GIF to their chosen channel in a matter of seconds leaving them plenty of time to pick out which D’lites to go for, then promptly heading back to have another go and create more content. If a picture is worth a thousand words, then what about a GIF? Sometimes all you need is some good old ridiculous facial expressions to get your GIF off to a good start. Our mobile photo booth can get on the road before you can even lace up your boots, which we did with our trip to Manchester to party with Dr Martens at Neighbourhood festival. Guests used the time between sets to visit our gif photo booth and grab a GIF as well as a print out souvenir before making it back down to the front of the stage. We think this GIF rocks! Using the product to create an immersive scene that guests can interact with is a great way to create an impactful gif. Ok, so technically this one isn’t a GIF, it’s one of our new MP4s but since our photo booth app for iPad works for stills, GIF’s and MP4s we figured this was game for our top 5. Jo Malone tasked us with fitting our set up into their giant gift box display for their Christmas press day. Guests got to walk through the gift box with the most beautiful array of Christmas baubles towards our camera that caught an MP4 and added a glowing light effect. Campaign footage was added as an end frame so guests got a video that was infinitely shareable. Here’s Ruby from our team exploring the gift box for the first time. Woolrich presented their fall/winter collaboration range with British design house Griffin in London this September. Guests donned winter jackets and pieces from the new range to test them against the elements capturing the snow storm in our selfie gif booth. We love a brand activation that is really interactive and these two protected themselves from the snow flurry whilst taking a fabulous GIF, There’s no business like snow business.